1. You’re an absurdist. Is it even worth me trying to ask normal questions? It’s always worth trying. We absurdists do appreciate it when you make the effort. 2. Help me out, what sort of questions should the press be asking you? 3. I’ll soldier on with something straightforward: tell us about your show. Lots. A range of foodstuffs, a few costume changes, and portrait of Texas senator Ted Cruz mounted on chipboard. There’s plenty to look at if your hearing or English isn’t good. 5. I’ve seen you working closely with plastic herons in the past. How man will you go through during the course of the Fringe? 6. During the daytime, do you have to be all normal and professional and do things like have meetings? Yes, I go to an office, sit at a desk, use a computer, and have meetings, just like everyone else. 7. What’s your favourite bit of your show? I act out a whimsical Neil Gaiman-esque fantasy called “The Mystery of Fennel”. It’s slow, bittersweet and deeply odd. 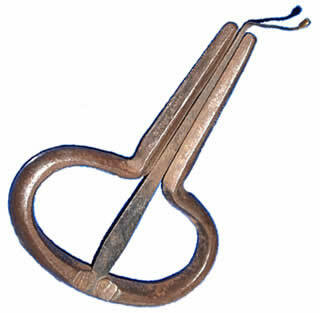 And I get to play my jew’s harp in it. 8. Do you have any Scottish independence material to crowbar in? If all that surreal stuff isn’t working, I’m ready, at a moment’s notice, to ditch my entire act and replace it with an hour of hilarious observations and anecdotes about the differences and similarities between Scottish and English people, finishing with a version of “The Loch Tay Boat Song”, sung with updated lyrics in an “Essex” accent. 9. What will your daily routine be in Edinburgh? Rise early, drink coffee, do admin, set up my show, flyer for my show, do my show, pace about a bit, drink coffee, watch a show, watch a show, perform a guest slot, meet folk, drink beer, watch a show, sleep. Oh, I forgot to eat. 10. Name 3 other shows you’ll be making sure you see? Edinburgh makes it hard to get to most of the things you want to do. There are lots of magnificent shows that I’m certain to miss – such as Ben Target, Dave Waller and Penny Matthews – because they’re on around the same time as me. But I will definitely go to see Tina T’urner Tea Lady, Alexis Dubus and Joz Norris.